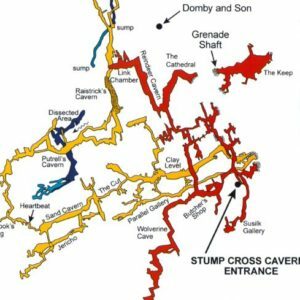 Stump Cross Caverns & How Stean Gorge have joined forces to offer an amazing new experience – Adventure Caving. Get off the beaten track and be one of the first to explore the many miles of passageway beneath your feet with our British Caving Association-qualified cave leaders. Until now the vast underground system has been closed off to the public and has only been available to the most experienced cavers and diggers, trying to find the infamous lake which is said to be hidden in the maze. The upper sections of Stump Cross Caverns in the Yorkshire Dales are home to an extensive and beautiful cave formations. As you venture behind a hidden gate with your instructor, you open up into a vast underground system which is where our adventure caving begins. Drop down the ‘Coal Chute’, crawl into the impressive ‘Clay Level’ and explore the giant passageways of the ‘Sand Cavern’ where caver Geoff Workman completed his renowned world record. How Stean also provide many other Caving experience days and courses at numerous locations across the Nidderdale AONB, The Yorkshire Dales National Park and the Peak District. If you cant see on our site just ask, our team of instructors hold some of the highest qualifications in the industry. 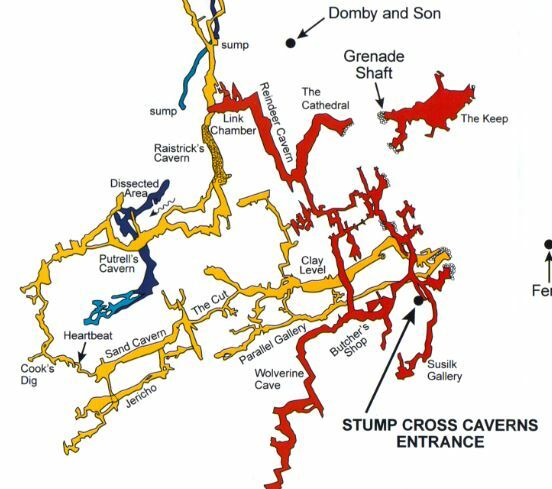 We will meet at Stump Cross Caverns cafe(HG3 5JL) and your trip will take approximately 3 hours. Morning or afternoon sessions are available from 10am-1pm or from 2pm-5pm. On arrival at Stump Cross Caverns you will be greeted by one of our friendly instructors who will be guiding your Adventure Caving experience. You will be supplied with a caving suit, knee pads, belt, wellington boots and a helmet with a mounted torch. This fetching attire will keep you comfortable and clean(ish) for your Adventure Caving experience. Once you’re kitted up, away we go on our Adventure Caving experience! Afterwards, kick back and relax with a FREE hot drink on us in the Stump Cross Caverns Cafe. You will also receive FREE entrance to the Show Caves to explore either before or after your Adventure Caving experience. Making this a full day out.